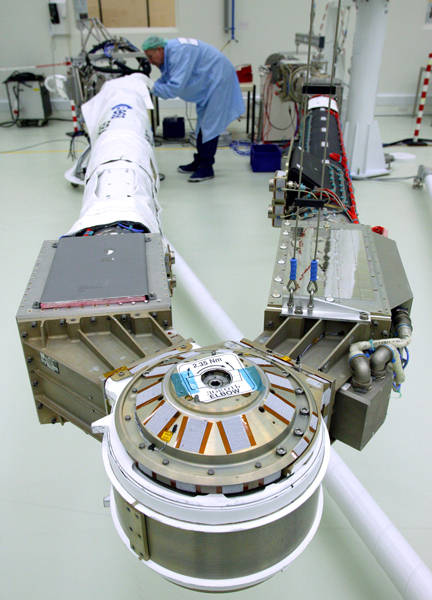 Developed by Airbus Defence and Space Netherlands, the European Robotic Arm (ERA) will be a crucial piece of equipment on the International Space Station. Developed by Airbus Defence and Space Netherlands (then under the name Dutch Space), the European Robotic Arm (ERA) will be a crucial piece of equipment on the Russian Segment of the International Space Station. The intelligent space robot, with a total length of 11 meters, looks like a pair of compasses and has the ability to ‘walk’ around the exterior of the ISS under its own control, hand-over-hand between pre-fixed base-points. Cosmonauts can control the robot from both inside as well as outside the space station. The ERA program, with Airbus Defence and Space Netherlands as prime contractor, comprises the delivery of the flight model, a spare model, a qualification model and several test models. Airbus Defence and Space Netherlands also delivers the control software and the advanced simulator system for operational planning, definition of procedures and mission evaluation and cosmonaut/astronaut training purposes.